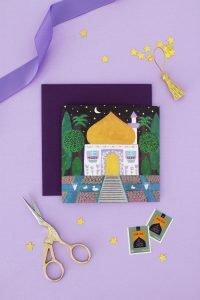 Ramadan Ideas: Date Place Card Holder – Hello Holy Days! Ramadan traditions vary from culture to culture, especially when it comes to food. One tradition that seems common amongst almost all Muslim cultures is the Prophetic tradition of breaking fast with dates. 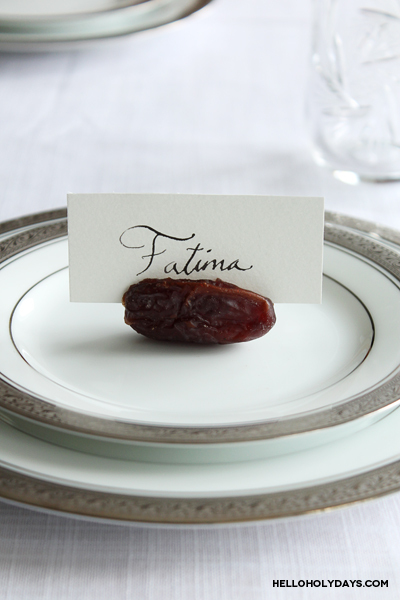 If you’re on the hunt for Ramadan ideas for your next Ramadan party, welcome guests to the table with these date place card holders for a personalized touch. They’re quick and easy to make and when the sun sets, guests can remove the card to break fast with the date. Use the knife to make a slit in date. Remove pit. Write guest’s name on card. Insert into slit where pit was removed.